British talent is en vogue in Germany, and Schalke followed the trend by signing Rabbi Matondo from Manchester City today. The 18-year-old Welsh international joins die Knappen in a deal worth €9 million. Furthermore, Manchester City will have a buyback clause that would allow the Citizens to resign the winger for €50 million. Overall, Rabbi Matondo continues a Bundesliga trend. Jadon Sancho at Borussia Dortmund has set the Bundesliga on fire. Reiss Nelson impressed at Hoffenheim last year, and RB Leipzig did everything at their power to sign Ademola Lookman after he impressed last season. Meanwhile, Bayern went all out, and ultimately failed, in their attempt to sign Callum Hudson-Odoi. While Bayern were public about their pursuit of Callum Hudson-Odoi, Schalke quickly had a deal sorted for Rabbi Matondo. Given that several Bundesliga clubs had shown their interest in the 18-year-old winger this was not easy. Ultimately, Bayern München, RB Leipzig and Borussia Dortmund all had signalled their interest. Schalke may have had a difficult season and by selling Naldo gave up an important part of identity earlier in the transfer window. In addition die Knappen have struggled all season despite finishing in second place last season. Following matchday 19 Schalke are in 12th place with just 22 points. Six points out of European contention Schalke are somewhat desperately active on the transfer market and are expected to make several more signings before the winter window closes on January 31. But in desperate times for Schalke Rabbi Matondo is anything but a desperate signing. “We have been working on this transfer for some time because we believe in Rabbi’s potential. He is extremely fast and technically very good,” Domenico Tedesco told the media on Wednesday. In fact, Schalke know that the 18-year-old, who will only be the fourth native of Wales to play in the Bundesliga, needs time to develop. “For that reason, we will give him time, which he needs, to get a foothold at Schalke and the Bundesliga,” Tedesco said. Born in Liverpool Rabbi Matondo moved to Cardiff as a young kid. The son of a former football player he joined the Cardiff City where he was discovered by Manchester City, joining the academy almost three years ago in 2016. 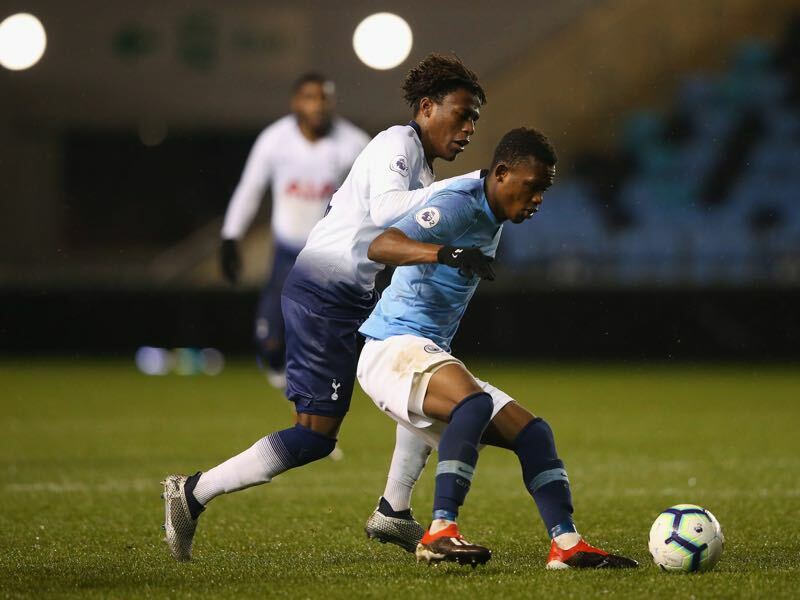 There in the shadows of the Etihad Matondo was developed into one of the most interesting talents in the United Kingdom. The Futbolgrad Network spoke to a source that is very familiar with the City Academy. “Rabbi Matondo is an absolute rapid flying machine, who is skilful and tricky,” the source told Futbolgrad. He is a flair player, who is a bit like Sterling. Really good in one-v-one situations. Predominantly right-footed but can go off both feet,” the source added. Playing in the UEFA Youth League, Chekatrade EFL Trophy, the U-21 qualifiers and one friendly for Wales, Rabbi Matondo averaged 74.09 actions per 90 minutes of which he completed 53.1% successfully. What immediately stands out is his dribbling rate. The winger averaged 15.23 dribbles per 90 minutes of which he completed 64.1%. He averaged 0.29 goals and 0.2 assists per 90 minutes and had a phenomenal 6.64 touches inside the box per 90 minutes. The big question is whether Rabbi Matondo can replicate those numbers in the Bundesliga. In general, a drop in those numbers can be expected as the 18-year-old gets used to his new surroundings. But with the right development Schalke may have found a player that they have lacked since Leroy Sané left the club for Manchester.